According to our sources, David Yassky’s office is moving full steam ahead with the India Street mural project. 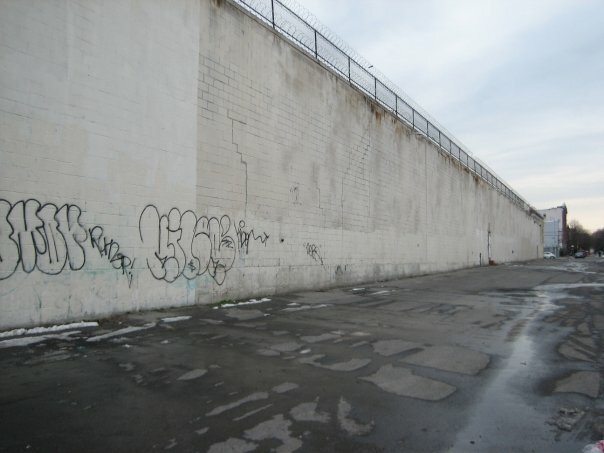 Thanks to a seed donation of $8,000, the North Brooklyn Public Art Coalition is now accepting proposals for the huge concrete wall in between West Street and the East River in Greenpoint. The building is slated for demolition in Fall 2009, but in the meantime, NBPAC is eager to infuse the space with some public art. There are eleven artists, teachers, and even some India Street residents on Yassky’s panel. It’s a fairly open ended project, but they are looking specifically for art that celebrates arts in the community, so you’ll get points with panel members for keeping proposals family friendly. Still interested? Submission guidelines and applications are available here. But hurry! Applications are due April 24th. Rami Metal, from David Yassky’s office, who headed up the second NBPAC meeting, called the India Street mural initiative, “a kickoff project for the coalition…which will hopefully snowball into a lot more public art projects in the future.” So if murals aren’t your thing, feel free to contact Rami and NBPAC with a different proposal. Based on those attending tonight’s NBPAC meeting, the coalition is interested in anything from sound art to dance performances, as long as its accessible to the public, located in North Brooklyn, and, well, free. More info at Greenpointers, here. On Wednesday, local Brooklyn artists met at Brooklyn Brewery to drink free beer and discuss possibilities for public art in North Williamsburg. The area under consideration, City Council Member David Yassky’s District 33, stretches from McGolrick Park in Greenpoint to Grand Army Plaza, with all sorts of fences, sidewalks, medians, and road barriers in between. The Open Space Alliance (OSA), a group advocating for both new and existing parks, has partnered with CM Yassky and various city organizations all aimed at beautifying public spaces and showcasing emerging local artists. “Art in the Parks,” a branch of the New York City Department for Parks and Recreation, has been supporting public art in all 5 boroughs for over 40 years. They look for site-specific work that integrates with the natural landscape and does not interfere with existing park functions or require unreasonable maintenance. The Percent for Art Program, initiated by Mayor Koch in 1982, requires that 1% of all new city-funded construction projects be put aside for permanent public artwork. Commissioned art can be in any medium, but the work must be integrated into the infrastructure. The Department of Transportation’s (DOT) Urban Art Program is more focused on temporary public art, and projects that integrate community outreach and art education. Artists must find an organization to collaborate with, and locations are limited to DOT owned sites. Other opportunities include a large mural on India Street, offered up by Palin Enterprises, and the Crest Hardware Art Show. If you missed the meeting and want to get in on the action, you can contact Rami Metal in Yassky’s office at rmetal [at] council.nyc.gov or you can contact the organizations directly: OSA, Percent for Art Program, Urban Art Program.